A young princess assumes the crown when her father goes missing. Her mission is to get him back and become the warrior she is destined to be in the new coming-of-age fantasy novel, “Warrior: Book 4 in the Maagy Series” (published by Archway Press). The book is the latest in author Virginia Burton Stringer’s “Maagy Series” and is available for purchase at: https://www.amazon.com/Warrior-Maagy-Virginia-Burton-Stringer/dp/1480867950/. Princess Maagy has survived Faith Quest and become the second woman to be knighted in five hundred years of noble history — and she is still only 16. Just when she thinks she has accomplished her greatest glory, her world comes crashing down when her father King Henry is taken hostage and spirited away in the middle of the night. She must now assume the crown and take command of the entire commonwealth armed forces before the ink is even dry on her Academy diploma. Dressed in her combat uniform with weapons at her side, she makes a solemn vow to bring her father home. 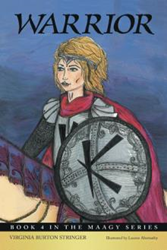 “Warrior” explores themes surrounding maturity and the strength of young women. Maagy must put her fears and misgivings about her capabilities aside to become the warrior she was trained to be. The young princess must also grapple with morality, as well as distinguish between truth and fabrication in order to rescue her father and lead her people to victory. Virginia Burton Stringer is a published playwright and author of the “Maagy Series.” Virginia Commonwealth University drama school prepared her for a 40-plus year career as an actor, director, high school drama teacher and now writer. She also earned a bachelor’s in biology from University of North Carolina at Charlotte. She and her husband Bill live in St. Petersburg, Florida. Readers can follow Stringer on Instagram @justmaagy.